Need to write a short, succinct paper, a report which will capture the attention of the reader and influence the outcome? Help is at hand in this punchy manual written by two knowledgeable scientists and teachers with experience in the worlds of academia, industry, and regulation. This book is written in easily accessible sections, each dealing with the practical problems that a newcomer to the field may experience and seasoned writers need to be reminded of. It is written with a lightness of touch, combining common sense with illustrative examples of how to address different types of situations. An attractive feature is that you, the reader, can test yourself on your planning skills and performance and detect the errors you may not even have been aware of, thereby improving your success rate in making important submissions. But as the authors say, while learning these skills requires care and attention, it does not need to be all drudgery and can also be enjoyable once the basic principles have been mastered. Having read the book, you may say “but I knew all these things before.” Good! So now is the opportunity to put them into practice, and by reading and noting the plans outlined in this book, you will become an even better communicator. There is wide consensus that the writings of William Shakespeare are of a high literary standard that has survived the test of time. It is clear that if text of the scene from the Merchant of Venice would be used as a bedtime story for a 3-year old, with the intention of imprinting on a young mind the concept that compassion and sympathy are useful attributes, it simply would not work. On the other hand, a story in simple contemporary English of the mouse that took out a thorn from the elephant’s foot would work as a bedtime story with a message on compassion. In the area of medical and scientific writing, the underlying science in a document may be solid and the use of language perfect, but if the text does not convey the intended message to the target audience, the document might be a dismal failure. A good document should not only be based on solid medical/scientific data but should additionally convey the correct messages to the target audience to achieve the desired outcome. 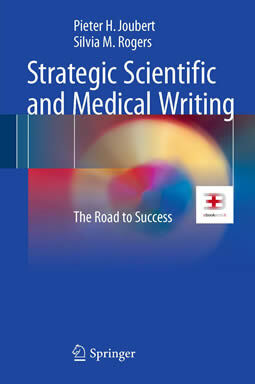 As the authors of this book we aim to assist you in becoming successful medical and scientific communicators, on top of being good writers. The key factor in achieving this is to imagine yourself as being in the shoes of the target reader(s) of your document and to pre-empt their response. In most cases, we will discuss medical/scientific writing in the context of pharmaceutical medicine and drug development. The principles, however, also apply to academic fields and other areas of medical/scientific writing, as well as to non- written means of communication. Silvia M. Rogers BSc hons., PhD, is the founder and owner of MEDIWRITE, a successful small company in Basel, Switzerland. She trained at the University of Liverpool, UK, in the Department of Pharmacology and Therapeutics headed by Professor Sir Alasdair Breckenridge. Before forming MEDIWRITE in 1994, she gained extensive experience in key areas of pharmaceutical research, including project management in a major pharmaceutical company. She is an active member of the American Medical Writers Association (AMWA) and the European Medical Writers Association (EMWA). She lectures on scientific writing at the University of Basel and has provided extensive training in various aspects of medical and scientific writing and presentation. She has written numerous expert reports, regulatory documents, scientific publications, and study reports for clients. Pieter H. Joubert MBBCh, FCP(SA), MD, is a clinician specialized in internal medicine in South Africa who trained in clinical pharmacology at the University of Rochester, USA. During a successful academic clinical pharmacology career, he was a member of several boards and committees. He also reviewed applications for approval of new drugs for the South African health authority. His key areas of clinical experience are in cardiovascular disease, nephrology, and diabetes.He currently holds an honorary professorship of pharmacology and therapeutics at the Medical University of Southern Africa and a visiting professorship in pharmaceutical medicine at the University of Surrey, UK. He has acted as a consultant to numerous pharmaceutical and biotechnology companies and has published extensively in books and scientific journals.